We’ve not seen many Radeon HD 6850 1GB cards use the reference cooler, probably because it was loud and didn’t cool very well. We’re therefore going to take a look at XFX’s attempt to keep close to ATI’s £150 pricing while delivering the quietness that we’ve become so used to from the Radeon HD 5000-series. The most obvious difference between the XFX and the reference card is that the end-mounted radial fan has been dropped in favour of a more conventional fan that’s mounted in the centre of the cooler. This 92mm fan blows down onto an aluminium heatsink, with air also travelling through onto the PCB and the memory chips. 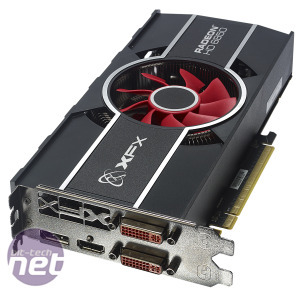 As this the first XFX HD 6800-series card, the cooler is the only difference from the reference card, so the performance of the card is identical to that of the reference card we tested for our ATI Radeon HD 6850 review. 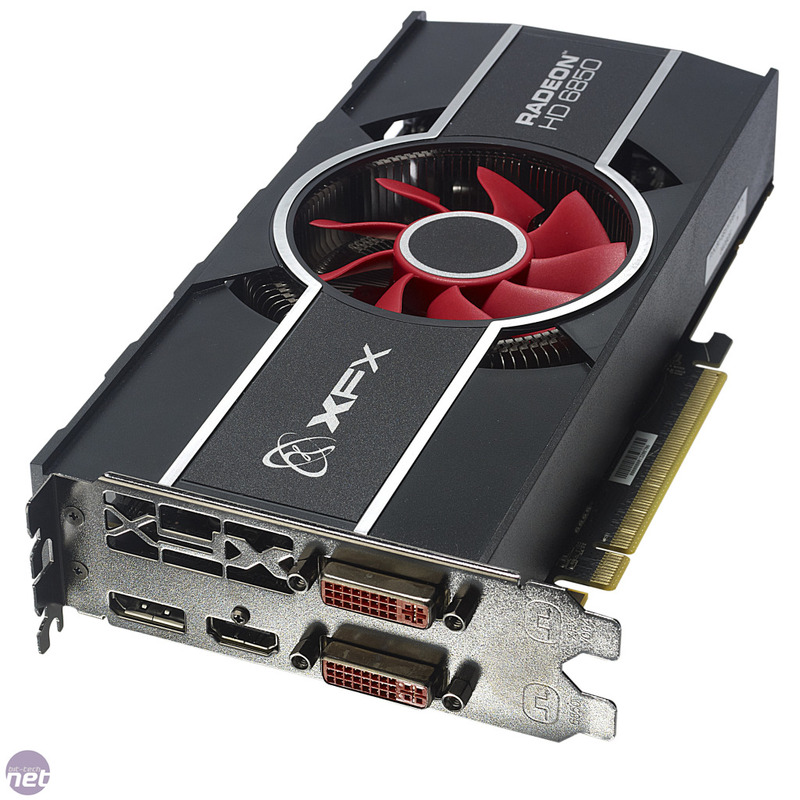 The change in cooler hasn’t lead to a price increase though – the XFX is as keenly priced as it needs to be to fight against the GeForce GTX 460 1GB on an equal footing. 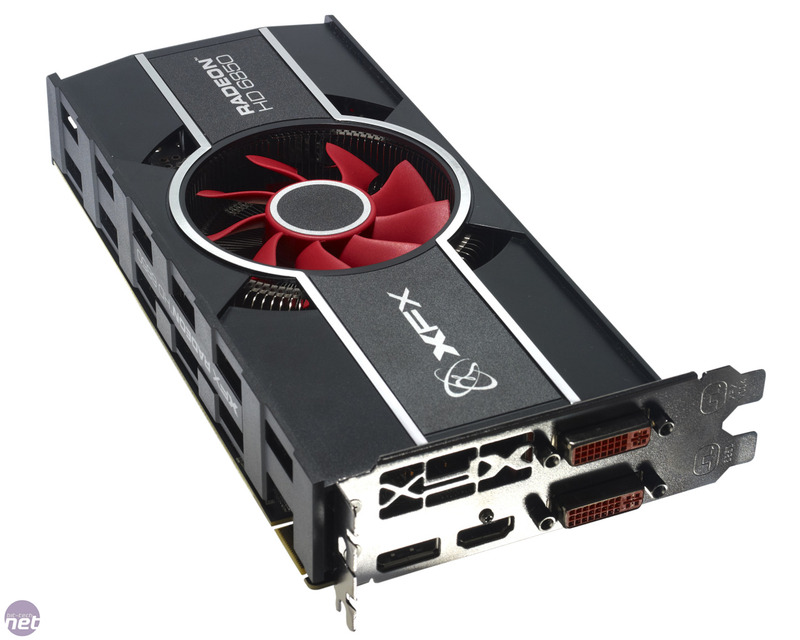 As a stock-speed HD 6850 1GB, the XFX trades places with the GTX 460 1GB across our test games – in some the XFX is slightly stronger and in others the GTX 460 1GB comes out on top. There’s little to call between the two cards overall as far as performance goes though, unless you only care about a certain game or setting (AA in Bad Company 2, for example). However, there was a clear difference between the cards when it came to the noise – while the reference cooler of the GTX 460 1GB was very quiet, the XFX was audible even over the hum of the air-con in the labs and did a fair impression of a hairdryer when we asked it to do any work. At least the cooler knocked 10oC from the load GPU temperature, even if the card did consume 11W more power while doing so. At the moment the only tool we can find that will overclock a HD 6850 1GB is the Overdrive portion of Catalyst – RivaTuner, ATI Clock Tool and GPU Tool don’t work, while MSI’s Aterburner only offered the same limits as Overdrive. The XFX hit these maximums easily, meaning that we could boost the GPU from 775MHz to 850MHz, while we could boost the memory from 1GHz to 1.2GHz (4.8GHz effective). We’d love to see how far the card could go with a less limiting tool. Regardless, this overclock yielded a decent increase in performance: at 1,920 x 1,200 the minimum frame rate rose from 25fps to 29fps with no AA applied and from 21fps to 23fps with 4x AA applied. While the lower temperature of the XFX’s GPU and the £150 price (despite using a custom cooler) are good to see, the loud fan didn’t win much praise. As a stock-speed HD 6850 1GB, the performance of the XFX was on a par with that of a GTX 460 1GB, but the reference cooler of the GeForce card is much quieter. 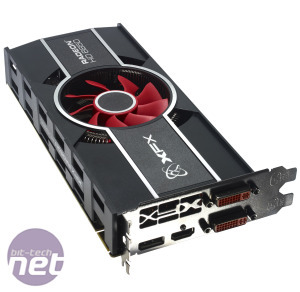 We’ll have another HD 6850 1GB partner online soon, but we’d rather have a standard GTX 460 1GB than this noisy XFX card.